You must have your full class 6 licence before you are allowed to carry a pillion passenger. Your bike must have a seat and foot pegs for the passenger. If it doesn’t, there’s a risk they might get a limb caught in the wheel or suspension area. By law, they must wear a helmet. It’s strongly advised that they wear other motorcycle protective clothing as it could save their life if you have a crash. Read more about different types here. A pillion passenger will need sufficient clothes to keep warm – as they are sitting fairly passively the wind chill can eventually get to them. The passenger must never operate the controls for you. You should never take a passenger on a bike that you haven’t ridden beforehand. If you are hiring a motorbike take it for a quick ride before coming back to pick up your passenger. You must get familiar with all the controls and the handling characteristics before you start carrying additional weight on the back. The extra weight of the passenger at the back of the bike causes the rear suspension and rear tyre to compress more. This means less travel in the rear suspension and a greater risk of the suspension bottoming out. The suspension should be stiffened and you should put more air in your rear tyre. If you don’t do this you are at more risk of catching your foot peg on the road when cornering. Because the motorbike will be pointing up more that means the headlights will be pointing up, too, which can dazzle oncoming vehicles. Adjust the headlight angle down if the lights aren’t self-levelling. The change in angle of the bike will affect the wing mirror position. Adjust the mirrors so that you can see over your shoulders and back up the road. You must get on first. Always get on the bike the opposite side of traffic, i.e. from the left. Start the engine, put both feet on the ground and pull on the brake lever. To get on the bike they should put their left foot on the left foot peg and hold your shoulders, using them as leverage to swing their right leg over the bike and onto the right foot peg. They must keep their feet on the foot pegs at all times, even when you’ve stopped. This is so that they don’t create a lean that you can’t control. Their seating position should be as close to you as possible but without crowding you, and must always be facing forwards. They can either hold onto the handrails or hold onto your shoulders, waist or belt. Make sure they’re not holding you so tight that you can’t breathe. If it’s a new pillion passenger then you will need to explain to them which bits of the motorcycle get hot so that they don’t burn themselves. More importantly is that they should relax and lean with you in the corners. Your bike’s steering relies on your balance and if they lean the wrong way it could prevent you from turning and cause an accident. There’s no minimum age for a pillion passenger in New Zealand (unlike Australia where it’s 8), but they must be able to reach the foot pegs and hold on safely. You are allowed to carry only one pillion passenger at a time – don’t think that you can get two kids on the seat behind you. When you want to stop the bike and get off, apply the brake, put both feet firmly on the ground and get the pillion to get off the bike first. Once they’re off you can put your stand down and get off the bike. With extra weight comes extra inertia and you will notice that your bike becomes sluggish to respond. Because of the extra weight acceleration will be dulled. However, remember that you’ve got all that weight over the back wheel therefore if you give the bike a lot of throttle there’s more risk of the front wheel rising. You will have to give the bike more throttle to move away otherwise you risk stalling. Look for larger gaps when entering a stream of traffic from an intersection as it will take you longer to get up-to-speed. Braking will feel different. You will have more weight over the rear of the bike and therefore you can apply more rear brake than usual because there is more friction available on the road surface through the rear tyre (usually the front wheel will do 75-90% of the braking). Braking could take much longer, especially if the pillion passenger is quite heavy. For example, if you are 80kg and your bike is 200kg, you weight 40% of the bike’s total mass. If you add a pillion passenger that is 60kg you are now a total of 140kg on a 200kg motorbike and that means you are 70% of the bike’s mass, and that will make a huge difference. You will have to brake more smoothly and progressively otherwise your passenger will keep headbutting the back of your helmet with their helmet every time you brake. Downshift before stopping and warn your passenger if it won’t be obvious to them. Remember to allow extra following distance because of your extra braking distance requirements. Cornering won’t be able to be done as fast as your bike is much heavier yet you still only have the same amount of tyre in contact with the road. You will have to slow down sooner and you won’t be able to power out as well. You should not have to change your riding position when carrying a pillion passenger. Your normal riding position is the one where you have the most control and you must not let a pillion passenger force you into a position where you have less control. Filtering through slow-moving or stationary traffic will become much more difficult as you will have less manoeuvrability and less clearance. The pillion passenger won’t have such a good grip on the bike as the rider. They will either have handrails to hold onto or will be holding onto the rider. If the road is going to be bumpy, slow down and warn the passenger to hold on. If they are bounced off the seat it could have catastrophic results. If your gear changes are harsh then expect to be headbutted every time by your passenger. It’s best to keep the load low and balanced using side panniers or saddlebags. 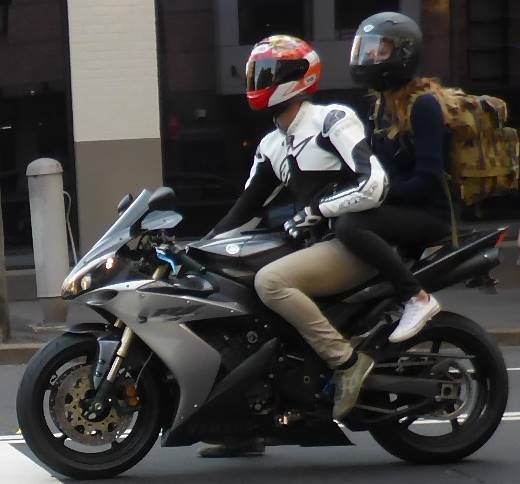 If your pillion wears a rucksack bear in mind it’s yet more high-mounted weight that’s over the rear of the bike. Even if your motorbike isn’t loud, it will still be difficult for you to make yourself heard. Having a system whereby the pillion can tell you if he or she is uncomfortable or needs to stop is sensible, for example, two taps on the shoulder. If you make a lot of journeys and want to maintain communication there are intercom systems available.